Made my favourite granola again, but this time with dried sliced strawberries. I like my cereal with plenty of nuts and not too sweet. Divide the oats in two - grind half of them into a fine powder. This is the essential step to get nice round clusters. Chop the nuts according to your liking and lightly roast in a pan. Preheat the oven to 165°C and line a baking tray with parchment paper. 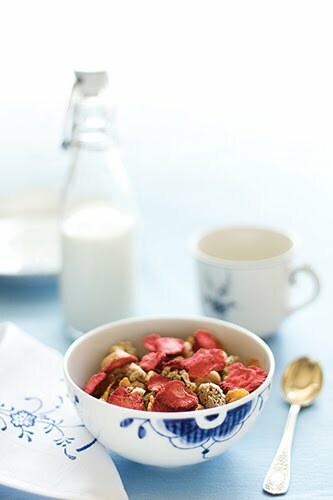 In a large bowl mix together oats, ground oats, chopped hazelnuts, chopped macadamias, flaked almonds and linseeds. Heat water with sugar, butter, salt and vanilla extract until melted. Pour the buttery syrup onto the dry ingredients and mix very thoroughly. Spread the mixture into a thin layer on a baking tray and roast in the oven for about 20 minutes, then flip the bits over, chop them into smaller bites and roast for another 20 minutes. If it's still not dry yet, flip them over again and roast for a final 20 minutes. Leave to cool. 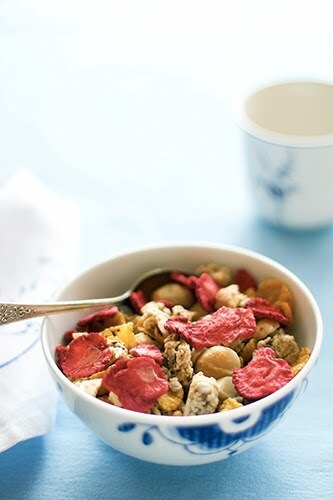 When completely cool, mix in the dried strawberries. I have a question though, there can I buy freeze dried strawberries in Estonia? Since I don't live in Tallinn, I'm not 100% sure but I tend to think you can't? I bought mine from the UK. It might be a good idea to start asking for them in the shops. I remember 2-3 years ago it was very difficult to find pistachios in Estonia, but now you can find them in loads of places. The more people enquire about a specific product, the sooner it will appear on the shelves.